Objects embody ideas and concerns common to mankind. From creating hand tools to dishes to metal alloys/ware, mankind created objects to meet evolving needs over time. As such, these objects tie in strongly with the development of human civilisation. Objects reflect our close relationships with our physical environment and the natural and animal world, and also capture the relationship we have with the spiritual world. Throughout history, humanity’s complex interconnection with each other has also been further demonstrated through objects. From December 5, 2015 to May 29, 2016, Treasures of the World from the British Museum at the National Museum of Singapore brought together many objects that illustrate the fascinating relationship we have with the objects we create and possess. Stone Hand Axe, about 800,000 years old. Lower Palaeolithic. Quartzite. Tanzania. Ru Dish with Emperor’s Inscription, AD 1086 to 1125. Stoneware with Celadon Glaze. China. 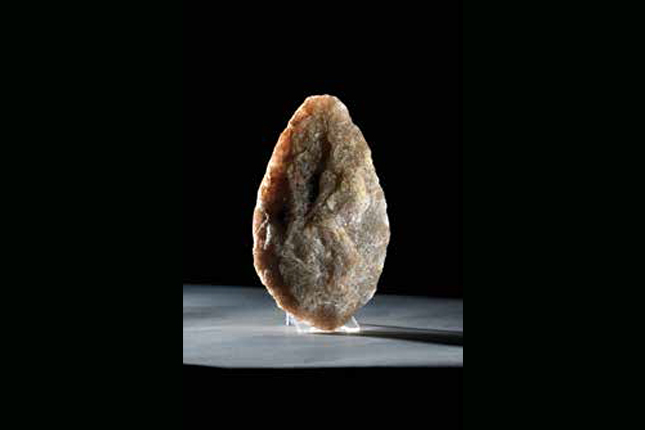 A 800,000-year-old stone handaxe, discovered in the Olduvai Gorge in Tanzania by the archaeologist Louis Leakey, is much like the chopping tool mentioned by Neil Macgregor, former Director of British Museum. It represents the beginning of mankind’s story, and our relationship with the objects we create. The making of the tools like the handaxe tells of man’s resourcefulness and ability to harness the raw materials from his physical environment. Man may know to utilise raw materials for survival and protection, but great skill and dexterity are required to transform a lump of stone into a tool, and to craft it exquisitely too. Based on many of the handaxes found in the Olduvai Gorge, it is speculated that early humans went beyond function and created them as art pieces and status symbols. The handaxes were simply too large and beautifully crafted to function as practical tools for everyday use. Blue-and-white Porcelain Dish, AD 1403 to 1424. Porcelain with Underglaze Cobalt-Blue Decoration. China. Seated Figure of the Goddess Bastet, Late period Egypt, 664 to 302 BC. Bronze. 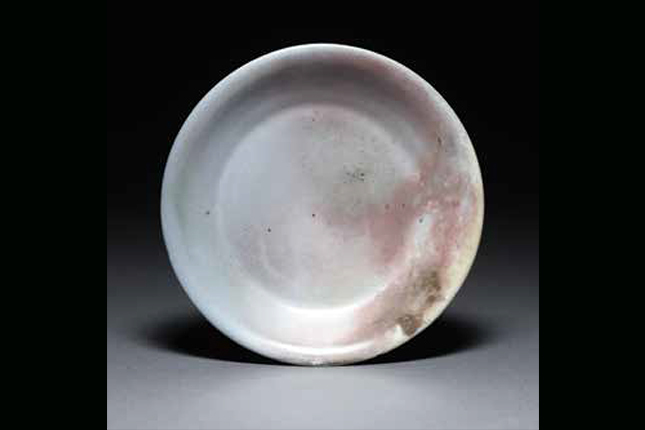 The transformation of clay into pottery, stoneware and porcelain through ring marks another development in man’s relationship with his environment. 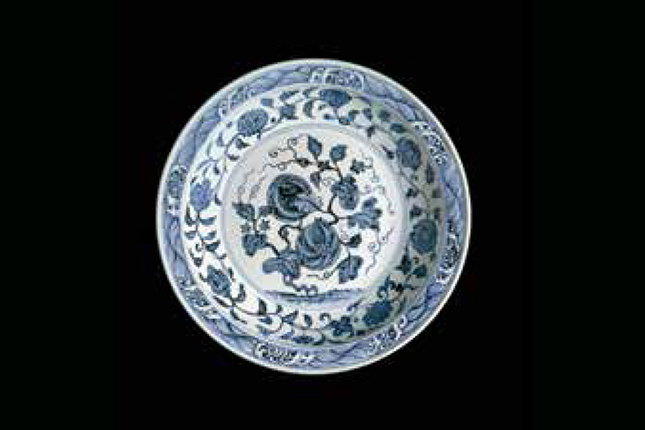 A Ru dish and blue-and-white porcelain dish in the exhibition are splendid results of man’s search for the finest materials, his exploitation of them, and the success of his many experiments in creating ne and delicate objects reserved only for the imperial family. Admired for their thin bodies, duck-egg blue glaze and delicate crack lines, Ru wares were only produced briefly for a period of about 30 years, from AD 1086 to 1127. Today, there are only 70 extant pieces, mainly in museum collections. Appreciated and sought all over the world later in history were Chinese porcelains with under-glazed blue decoration, commonly known as “blue and white” porcelain. These Chinese porcelains made from a combination of porcelain stone and kaolin, which was then found only in China, were very much adored for their highly vitrified, pure and translucent bodies. Produced mainly in Jingdezhen in southern China’s Jiangxi province, many of these wares were exported to the Near and Middle East and other countries in Asia from the fifteenth century onwards. Great quantities of these Chinese export porcelains eventually found their way to Europe and were all the rage there in the seventeenth to eighteenth century. Ritual Wine Vessel, 500 BC. Bronze. China. 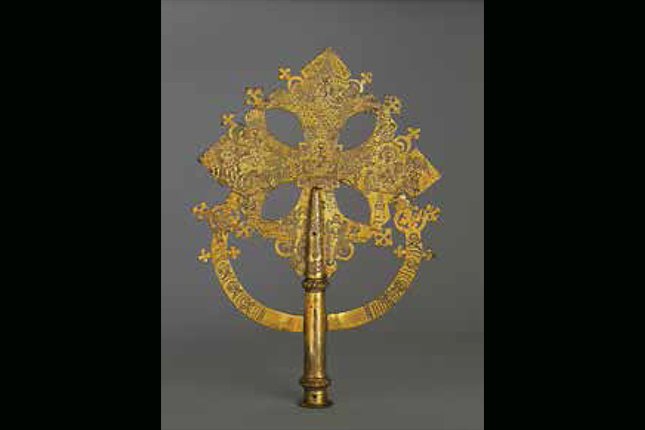 Processional Cross, AD 1730 to 1755. Bronze and Gold. Ethiopia. Besides ceramics, the course of metal technology development also demonstrates our abilities in transforming our natural resources to make objects that will protect, serve and bolster our social positions. Man created bronze using copper and combining it with other metals such as zinc and lead. Through inventive techniques – such as mould casting, lost wax technique, repoussé and chasing – bronze figurines, weapons, armours, shields, vessels and ceremonial implements were formed and decorated in various cultures. 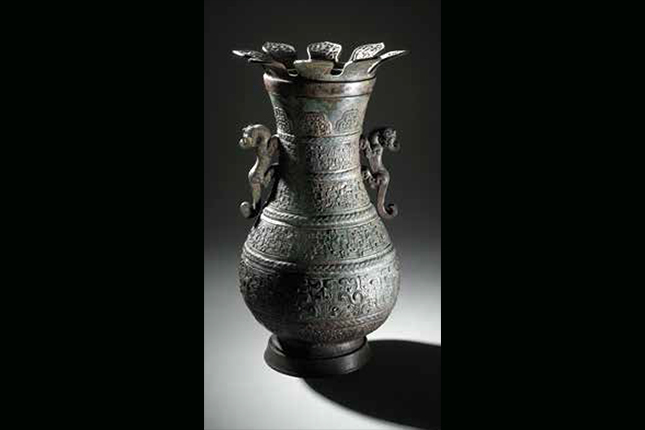 Examples of these bronze objects can could be found in the Treasures of the World from British Museum exhibition. 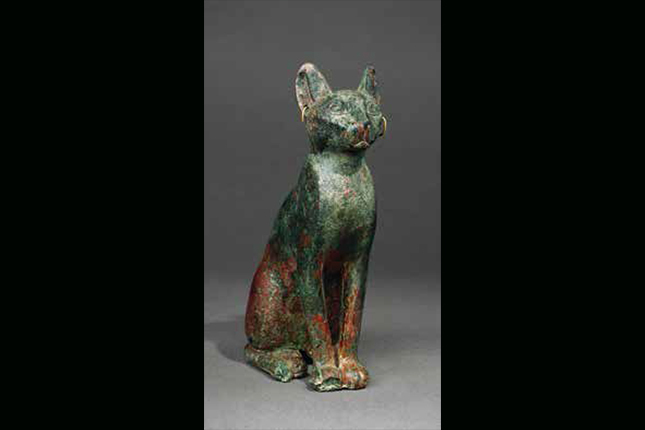 They range from the figure of the Egyptian goddess Bastet in the form of a cat (dating to the Late period of Egypt from 664 to 302 BC), an Eastern Zhou wine vessel from the Houma Foundry in China, a shield from North Wales dated to the Late Bronze Age (around 1200 to 1000 BC), to a processional cross from Gondar, Ethiopia (dated AD 1730 to 1755). Harmensz van Rijn, Rembrandt. The Three Crosses, AD 1653. Dry Point Etching. 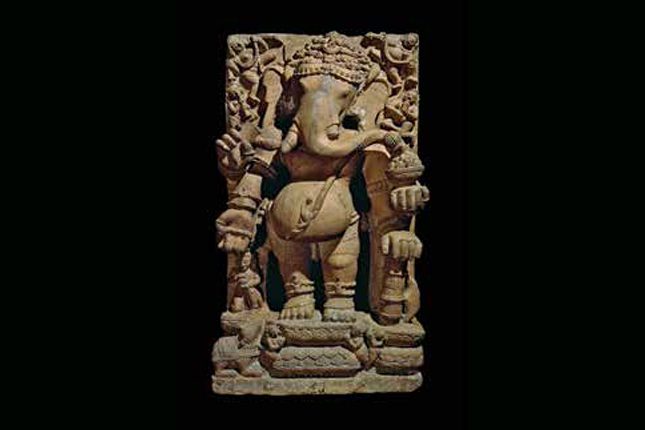 Statue of Ganesha, around AD 1200. Sandstone. India. In negotiating our harsh environment and fighting for survival with other species, man turned to the spiritual world for protection. Spirits were appeased and propitiated; protection was sought from gods, goddesses and ancestors. The teachings of great beings were studied and revered, and religious systems and beliefs were created. In some societies, certain animals were considered sacred and venerated as deities which were both feared and loved. An obsession with afterlife arose in certain cultures, where elaborate ceremonies and belief systems were created to ensure a smooth transition to the netherworld and/ or to achieve everlasting life after death. Humanity’s relationship with the spiritual realm can be seen in many objects, ranging from the mummies of ancient Egypt, the sculpted or cast figures of Buddhas in Asia and Southeast Asia, to the exaltation of Christ or the Virgin Mary in prints and votive plaques. A masterpiece of this communion with the spiritual realm can be found in the work of Rembrandt (Harmensz van Rijn, 1606 to 1668), entitled The Three Crosses and dated AD 1653. 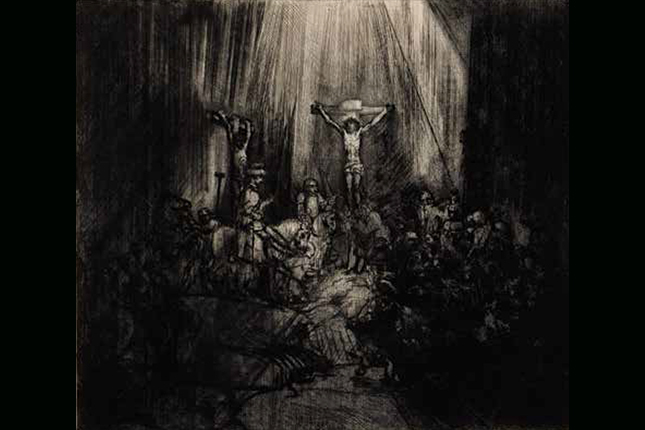 Here, the scene of Christ’s crucifixion is highly dramatised through the clever use of light and shade. The frail body of Jesus is situated in the centre, and all light and focus are on him and his death. Only upon closer study can one see the confusion and suffering surrounding Jesus. Prints such as this were a means of bringing Biblical stories vividly to life and to aid in private prayers. 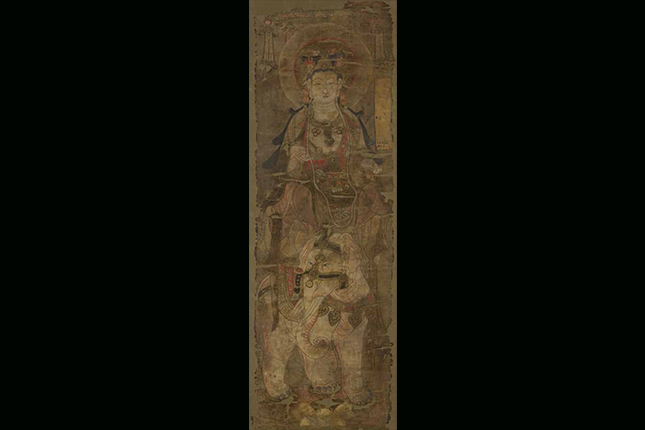 Other striking examples from the exhibition that tell the story of man’s spiritual connections include a Gandanran Buddha, a statue of Ganesha from Orissa, India and a Tang dynasty silk painting of the Bodhisattva Samantabhadra, found in the Mogao Caves in Dunhuang. Painting of the Bodhisattva Samantabhadra, Tang Dynasty (around AD 750 to 850). Ink and Colours on Silk. 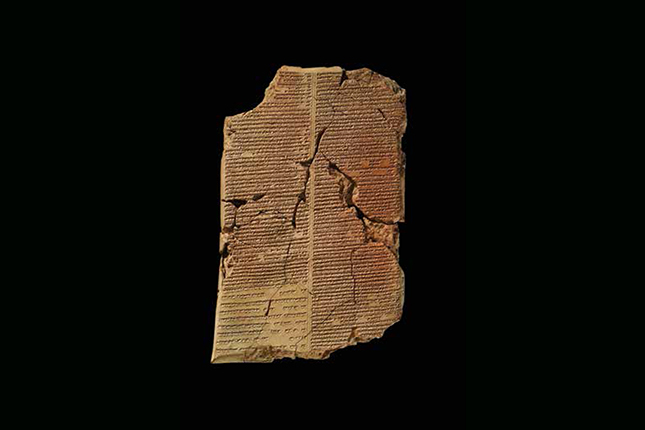 A Tablet from King Ashurbanipal’s Library, 700 to 600 BC. Clay. Northern Iraq. Through objects, we can also trace man’s communication and complex relationships with each other. With the invention of writing, information could be passed down as records could be kept. One of the earliest forms of writing was in the form of a cuneiform (wedge-shaped) script inscribed on clay or stone tablets from Mesopotamia. The relationship of man with each other were outlined, defined and reinforced through writing. Social hierarchies and political legitimacies were thus strengthened too. Knowledge was also passed down via written word. Representative of this are insights into common ailments and their remedies, found on the tablets from King Ashurbanipal’s library in Nineveh, northern Iraq. A clay tablet from his collection, dated 700 to 600 BC, details stomach disorders and prescribes remedies for each. It is part of a therapeutic series entitled “If a man suffers from a phlegmy cough, and it turns into intestinal disease”. Through the ages, man has sought to define his place in society through the use of symbols, the enactment of rituals, or performance of ceremonies. Objects carved with powerful symbols, sometimes passed down for generations, acquired extra blessings and power. 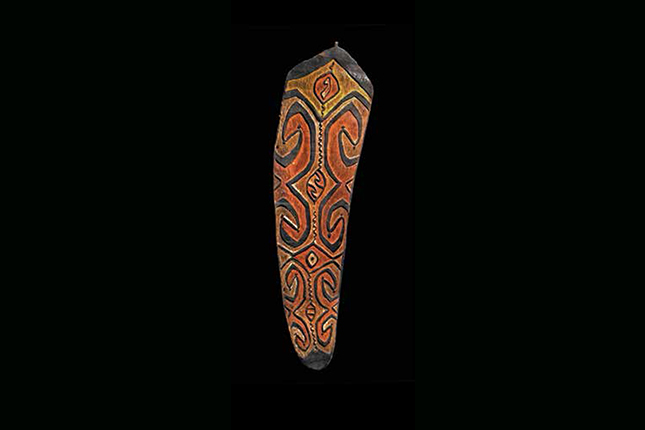 An Asmat warrior would have carried a war shield to emphasise his strength and to intimidate his enemies. Personal adornments made from rare, precious materials and attached with powerful symbols were worn by man to define his position and to set him apart from other men. 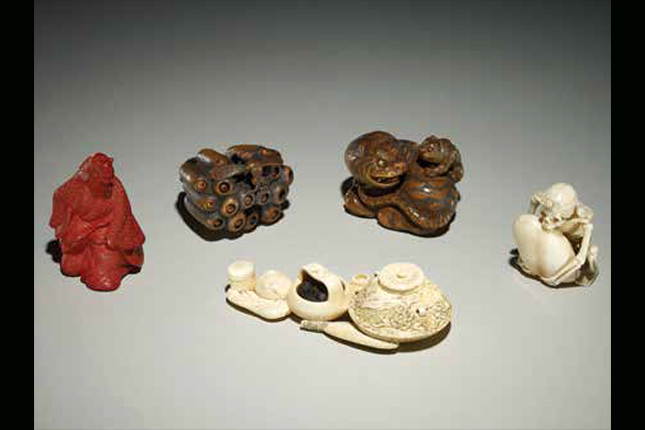 Netsuke were intricately carved toggles, worn by Japanese men from town during the Edo period. They were miniature and portable art pieces which were an essential part of the costume of a Japanese townsman, defining his status and wealth. War Shield, early 1900s. Mangrove Wood and Natural Pigments. West Papua. Group of Netsuke, Edo period (1800 to 1900). Ivory, Lacquer, Wood. Japan.